Babies don’t come out in real life as fast as they do on TV, so with a few minutes of time on my hands in between contractions, an epidural and the blessed event I figured I’d post about the cuisine here at Bryn Mawr Hospital. This being a hospital and all I was a wee bit concerned about the offerings in the cafeteria (would it be nothing but healthy stuff? ), but clearly they are catering to a wide audience with their extensive offerings (salad bar ->nachos bar -> deli sandwiches -> pastries). Was very happy to see (4) burger options on the menu, advertised as fresh from the grille sirloin. I opted for the cheeseburger (white American), and as you can see from the above it came wrapped a la your typical fast food burger. A self-serve toppings bar was available with some bright red tomatoes, shredded lettuce, sliced onions, pickles and bacon as options. I actually skipped over the bacon (just seemed odd in a hospital – bacon will probably bring me back here sometime soon enough) and loaded up with a few tomato slices. End product was about 1/3 lb (maybe even closer to 1/2 lb) cooked medium + all the way through and was served on a decent quality kaiser roll. With some ketchup and mustard this baby doctored up to be pretty decent with a very strong beef taste. No doubt this was a Sysco or similar food service burger, frozen until just recently but prepared well for the lunch time rush. Wife can’t eat anything but ice chips and freeze pops (and nurse wondered what the smell was in the room in a manner that clearly said “who the heck is eating fast food in here!”) so I couldn’t get another opinion on this but it might be the real deal. Not sure how many folks would stop by here for a casual lunch, but if this labor continues any longer (nurse mentioned someone in labor for 3 days…) I might convene a meeting of other burger lovers for further sampling. Thanks for all of the well wishes to date (have been posting some on Twitter though promised wife I would not “live Tweet” the birth). The world will welcome another burger lover very soon. UPDATE: More burgers will have to wait…he’s here! if you are ever in the Kansas City area you have got to try the Heart Stopper. The Double Nickel DIner in Olathe Kansas sells it. They have other burgers there like the Fat Boy and the Juicy Luci burger. A real burger paradise if you are interested. Seems all too fitting that you chose to comment on the hospital posting on my blog. That sounds delicious but deadly. Might have to head to KC. 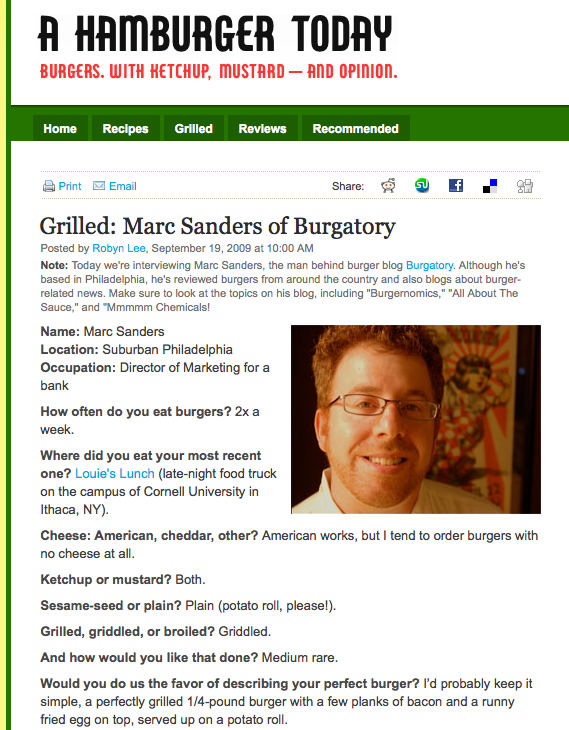 Thanks for the great tip and for visiting burgatory.com!